Having weathered plenty of Microsoft attacks over the years—including the well-known Windows Phone spots that mercilessly mocked Siri—Apple might have had reason to feel skeptical, perhaps even hostile, when it saw dozens of Microsoft employees approaching its 5th Avenue store in New York City back on Nov. 16. But Microsoft, it turns out, was coming in peace—to film a holiday spot about overcoming acrimony and embracing harmony and togetherness. The campaign, from m:united//McCann, started out as a way for Microsoft to celebrate its own presence on 5th Avenue—it opened its own flagship store there in October. And with the holidays approaching, the company clearly felt like ingratiating itself by being a good neighbor, particularly to its daunting tech competitor just to the north. 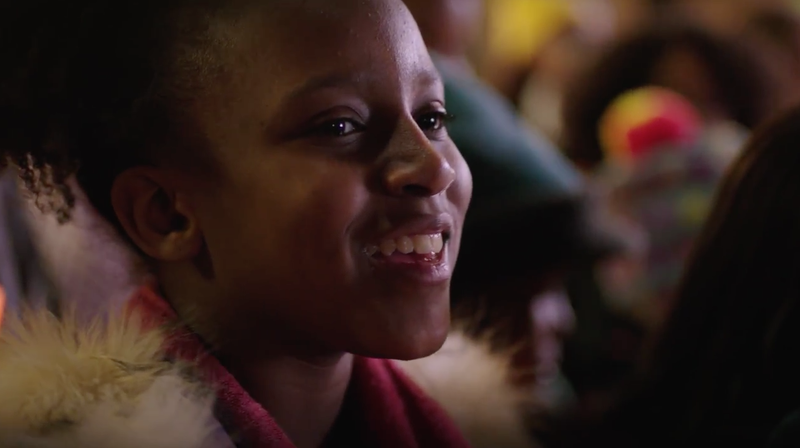 The company held auditions around the country to find Microsoft employees for its chorus, and also invited members of a Harlem youth choir to join. Together, they sang Jill Jackson Miller's song "Let There Be Peace On Earth." And as you can in the closing frames of the video, the Apple employees were clearly touched by the performance. "It was a fitting welcome to the neighborhood by Apple and a warm celebration to begin the holiday season," m:united said in an email. And indeed, with so much violence and animosity in the news lately, this spot feels surprisingly relevant—a small gesture of peace by corporations that usually prefer relentless fighting. Joel Simon Music arranged the song. Doug Katsaros was the musical director and conductor of the choir. Tool of North America's Erich Joiner was the director.